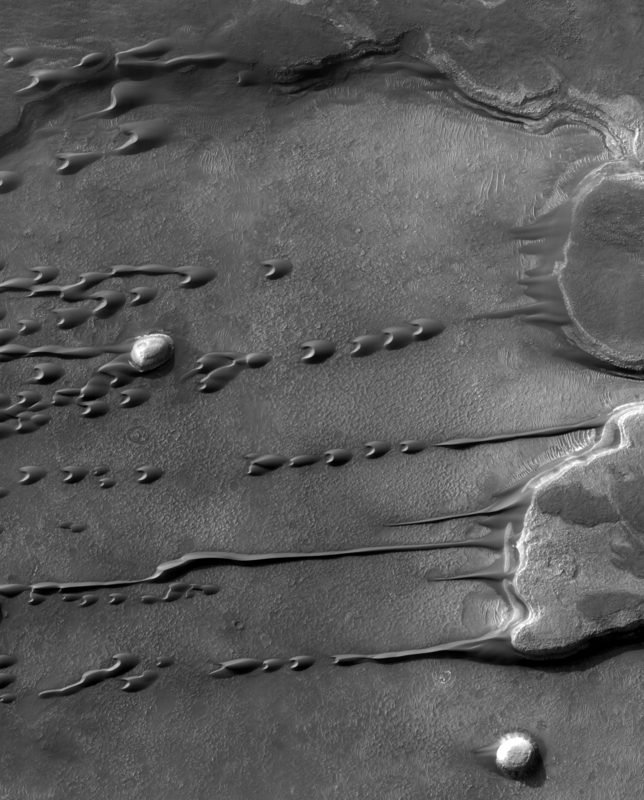 Sand dunes on Mars appear to flow and drip like a liquid. Hi pals. We need your votes for BabyLolly in the Rising Sun Startup Rally for this year’s The Next Web conference. Please lend us your support by clicking the “Vote Now” button. With enough votes for our video we’ll be able to present at the conference later this month in Amsterdam. The toolkit presentations continued after lunch. I’ve written about Processing here before. It is still my goto tool for visual coding. Fry, Reas, Shiffman, and Greenberg all in one room. Should the concept of literacy be expanded to include programming fluency. Max / MSP / Jitter is a graphical programming environment for music, audio and media. A patcher based languages that shares roots with Pd which was demoed in the morning. Reminder to check out the work of Michael Joaquin Grey, especially Recapitulate: Retrace, Erase, Repeat which uses Goya’s The Disasters of War etchings as source fodder. Vvvv is a video-synthesis toolkit. The programming interface is similar to the patch-base language we’ve already seen (Pd and Max/MSP), graphical function-blocks connected with wires. For a more detailed look read Ctrl+B For Concurrency. Of the visual languages presented at the conference, vvvv is the only one I downloaded and experimented with. Oh I do wish for infinite time to play with all these wonderful tools. Read the vvvv licensing page, commercial vs. non-commercial uses. This language doesn’t contain any explicit looping structures. Nerdy VJs would go wild for this. And then we had a cookie break. Reminder to check out In the Mod. openFrameworks is a C++ library for creative coding. It was described as a glue languages wrapping together several commonly-used open-source multimedia libraries. Minimal Design: There are very few classes, and inside of those classes, there are very few functions. Looks fast! Might lend itself nicely to augmented reality projects. The Dorkbot Pecha Kucha at the Brillobox was fun. I presented early having greatly under-estimated the length of my presentation. The 10 minutes were over quickly, and I fear my last few minutes were a muddle. Delicious beers were consumed. I chatted with some wonderful people. Floating-Lightbulb of the night, bringing Jonathan Brodsky idea of coding competitions to RRC. Panel discussions, CODE and FORM at the Pittsburgh Center for the Arts, pizza and beers with some interesting folks, and then a cab ride to the airport and home again home.